Centipedes are members of the Chilopoda class of arthropods. Their exoskeletons lack a waxy layer that would otherwise help them retain moisture. As a result, centipedes prefer damp places when they are not hunting for food. These creatures have adapted well to a wide range of climates and habitats. Forests, moist soils and even homes are attractive to centipedes dwelling in more temperate climates. 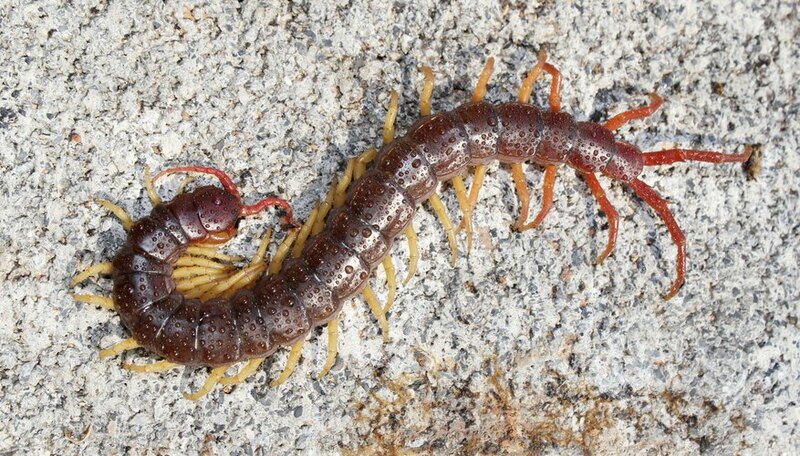 Feeding on worms, snails, spiders and other arthropods, temperate zone centipedes seek shelter under rocks, in rotting logs, in leaf litter, and in moist basements or crawl spaces. Soil centipedes, which belong to the order Geophilomorpha, are one example of a species that makes its home in temperate climate zones. Soil centipedes burrow into the ground in much the same way as earthworms. You might find one in your garden or backyard, in agricultural settings, or in wooded areas. Centipedes are abundant in the tropics. Tropical climates include rain forests as well as other regions with warm, humid air. These are ideal conditions for moisture-seeking centipedes, which can grow large under tropical conditions. The order Scolopendromorpha includes the “giant centipedes” that call the tropics home and grow to nearly a foot long. These centipede species grow big enough to feed on larger prey than the smaller, temperate zone centipedes. Their diet includes bats, mice, frogs, birds and snakes. Centipedes are terrestrial creatures, but some make their homes along the water’s edge in coastal areas. These species are typically halophilic, meaning they can live in areas with high salt concentrations. Many of these centipede species are in the order Geophilomorpha, and are often called “wireworms,” or “wire centipedes.” These species may hide between seawater-washed rocks, among clumps of algae, or they may burrow into the sand at the shore, similar to their temperate zone cousins, the soil centipedes. While deserts may seem a strange place for centipedes given their proclivity to moist climates, these arthropods have adapted to the conditions. Seeking shelter from the sun, desert centipedes hide in any crevice they can find, including under rocks, in litter, between bricks and in potted plants. A combination of shade and any type of condensation or moisture attracts these species, which include the common desert centipede (Scolopendra polymorpha). Like other species, desert dwelling centipedes feed on insects and their larvae. The bigger specimens will prey on larger animals, such as lizards and frogs. Korpella, Robert. "Habitats of Centipedes." Sciencing, https://sciencing.com/habitat-centipede-8518236.html. 24 April 2017.